The aquafil Portable Refill Station with Drinking Fountain is a robust compact unit, built to endure the harsh realities of the public environment. With anti-bacterial dispensing nozzles delivering quality filtered or non-filtered drinking water, it is ideal for large outdoor public events such as Concerts, Sporting Events, Shows etc. It is the healthy and environmentally alternative to plastic bottled water and can limit the amount of waste disposed of by cutting down on the amount of one use plastic drink bottles used. It is a quick an easy alternative to keeping the public hydrated whilst educating them on the benefits of drinking tap water. The aquafil Portable Refill Station serves as a dynamic educational tool in the fight to reduce plastic waste and conserve precious resources. Full colour graphics are available on most of the aquafil range. Our portable water fountains are a valuable tool in helping promote a sustainable way of living and encouraging a healthy lifestyle. 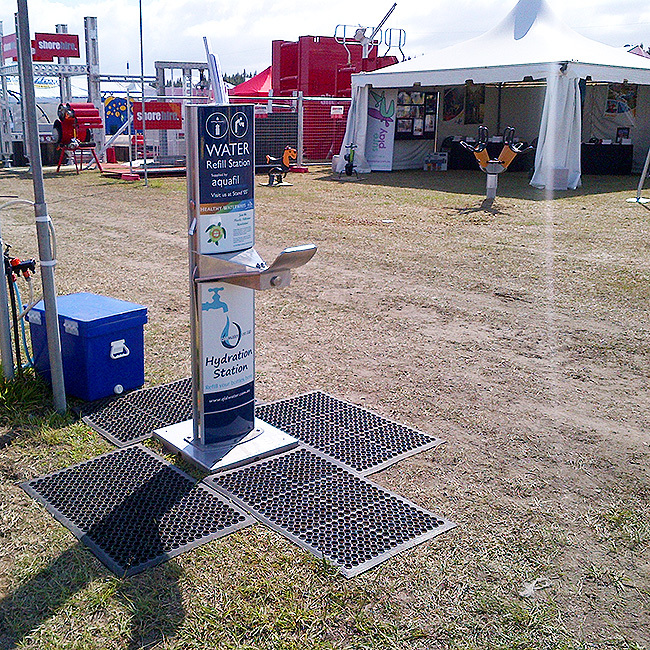 The aquafil Portable Refill Station is easy to store, transport and use and it is always on hand for those hot summer days when additional facilities are needed at public events. The benefits of having clean, fresh drinking water instantly available at all times cannot be underestimated. By the time we feel thirsty, we are already partially dehydrated and when kids are playing it is important they keep their hydration levels up. We should all be carrying reusable bottles to fill up whenever we can and having a water bottle refill station or a portable water fountain nearby not only keeps us hydrated but also saves us money.